In our last issue, we shared ideas and strategies for promoting civil discourse practices in the classroom. In this issue, we are offering even more support to help you create meaningful dialogue among students. We have included a guide for designing and developing discourse into your lessons, a series of visual thinking activities, sentence starters with differentiated prompts, and finally a “cheat sheet” for making it easier to build student discourse into your lessons. What is the Purpose for the Talk? What talk protocol and/or prompts do you want to use? One of the simplest and most versatile protocols is the trusty “Think - Pair- Share.” In this protocol, the teacher poses a question, students have time to think, then they discuss their ideas with a partner, and finally they share with the whole class. Although the structure is simple, it is most successfully implemented when students are shown routines and procedures for using this protocol effectively. Elementary students can be taught to sit “Knee to Knee & Eye to Eye” when talking in pairs. Older students will need explicit instructions as well. Some teachers use the 4Ls - look at your partner, lean towards your partner, listen, and lower your voice. Modeling and providing feedback are a vital part of incorporating talk protocols. What type grouping of will you use? Grouping your students should be intentional rather than random. You can choose to group students by readiness levels, interest groups, learning styles, or other factors can be considered - such as behavior. Switching up the types of groups keeps students engaged and interested. Students can work in pairs, triads, groups of four or more. Different tasks lend themselves to different sized groupings. Be sure to choose the right type of grouping for the task at hand. What routines and procedures do you need to have in place? Having a classroom of students all talking at the same time can seem overwhelming to many teachers. However, if effective routines and procedures are in place, this seemingly daunting situation can run very smoothly. Move into and out of the groups. Know what to do they do when they get there. Know the appropriate noise level for talk groups . Teach them to use their three inch voices or have a chart with Talk Levels. See elementary and secondary examples in the Try It Out section to the right. How to take turns talking and how to really listen to others when they talk. At the beginning of the year, it is helpful to implement a talking tool to remind students that only one person (the one holding the tool) can talk at a time. You can use a talking stick, or even a marker, as a talking tool. See link to elementary talk and listen sticks in the Try It Out section to the right. We can also ask students to paraphrase what their partner said to hold them accountable for really listening. Using anchor charts on the wall is a great way to remind students of the expectations for the essential routines and procedures. Students need to practice, practice, practice the routines for partner and group work so that no energy is wasted in messy transitions or misbehavior. How should the classroom be arranged? Every aspect of our physical classroom and every instructional choice contributes to the success of meaningful student talk. Desks should be arranged in a way that supports the goal of student talk. If students are working in pairs, the desks should be arranged in sets of two. If working in small groups, there should be clusters of desks together. In some classrooms, where a lot of student talk happens, the desks are arranged in sets of two as a default. These teachers then teach their students to get in groups of four or “pod themselves” when they need to work in a small group. Students in these classrooms have practiced routines and procedures to move efficiently into small groups so that time isn’t wasted during this transition. 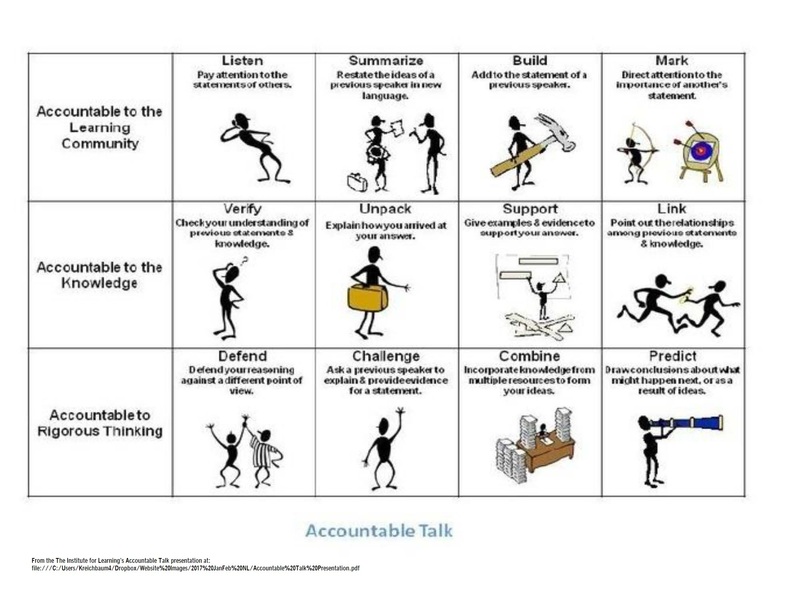 How will you have students self reflect on their talk skills? It’s important for teachers to give students feedback on their group and partner work talking skills. Providing students with rubrics and letting them know how they can be successful is a great first step. Before they are assessed with the rubric, provide opportunities for them to watch videos of other students talking and evaluate their performance. You can find videos online or you can record students and have them watch and assess each other. This experience will help students truly understand what it means to have a successful academic discussion and to hold themselves up to that expectation. Choose one of the following videos to watch with your colleagues. Discuss your observations, using any of the talk prompts that you found on the link provided. Comment on what resonated with you, what questions you have, and what will be the first thing you will try. Some Activities/Resources to help bring the info to your classroom. Improving Student Thinking: Thinking Routines - Lesson planner for deepening thinking through talk. Some meaningful, related web content. Bring Kathleen to your school! Kryza, K., Brittingham, M., & Duncan, A. (n.d.). Transformative Teaching: Changing today's classrooms culturally, academically, & emotionally.